Best of all, Yahoo’s library is open-source and has been released under a BSD license, so it’s free for all users. 1. Yahoo hosts the files for you. Save your bandwidth. 2. The files are minimized and combined into a single file. That means faster load times for your users. The rotating content pane is a common sight on information-heavy pages. For example, Yahoo’s homepage has a version that cycles through the top stories of the moment. In YUI, this is called a carousel and implementing one is easy. You can grab the code for this entire example in Webmonkey’s Code Library, saving it as an HTML file, or simply follow along with each portion below. There are two pieces to the above code. First, theinit_carousel function that has the three lines necessary to transform the ordered list into the carousel. Then, the final line tells YUI to wait for the Document Object Model (DOM) to load in the browser before calling theinit_carousel function. Normally programmers try to avoid infinite loops, but this is a different kind of loop. Here we want to tell the carousel that when the next button is hit on the final panel, it can go back to the first panel. Even better, let’s have it move to the next panel automatically. Each of these features is part of the Carousel control from YUI. With just a few keystrokes, we can add them to our current carousel. /isCircular/ tells the final panel to go to the first panel next, to make it loop. /autoPlay/ tells how many milliseconds to wait before going to the next panel. I set this one to 2000, which is two seconds. If you load up this new version, you’ll notice that the panels do go ’round and ’round when you click. They don’t advance on their own, despite adding autoPlay to our options. That’s because the carousel also needs us to start the autoplaying. Now your carousel should loop infinitely, all on its own! The Carousel example in the previous section shows how YUI Library can help you present content in a nicer way. In this section, we’ll see an interface tool that’s even more functional. The Calendar control accepts a date from a user and adds the result into a text field, which means you get to decide the format. You can download this entire example from Webmonkey’s Code Library or follow along with each portion below. Like the Carousel example, the Calendar object starts as normal HTML. In this case, we need a standard text box and an empty div, which provides the hooks necessary for YUI to build the calendar. Just two lines to initialize the calendar! One creates the object and the other draws it to the screen. Then one final line calls the init_calendar function when the DOM is ready. Adding events will help us add these two features. Our calendar looks good, but it sure acts weird. In this section we’ll add two events to make the calendar behave normally. There are only three lines here, though it looks like more because of empty lines and those that are commented out (the ones that start with //). The first line hides the calendar when it loads. We don’t want to show it until the user clicks. The second line creates a new event. Whenever the text box (with id=”datefield”) receives “focus,” the cal.showfunction will be called. That one line is enough to make the calendar appear whenever the user clicks into the date field. The parameters (/type/, /args/, /obj/) are decided by the Calendar control and automatically passed to our function. The /args/ variable contains our date data, which I extracted into three new variables: /year/, /month/, and /day/. Finally, the last thing I do is to hide the calendar (passed as the /obj/ variable), because we don’t need the calendar displayed once the user has selected a date. Add a rich text editor to give users more control over how their content looks. Rather than ask for numbers, use a slider to get numeric input. Similar to the Carousel, use the TabView to segment content into panels to be viewed on a single page. Read the YUI team’s article on skinning YUI, which lets you decide exactly how the widgets are displayed. YUI CSS Grid WordPress Theme. This is my first WordPress Theme based on YUI CSS Grids. It comes with 8 selectable color schemes, 5 different page widths and 6 combinations of page layout. Download YUI CSS Grid WordPress Theme. Customize your theme using the WordPress Dashboard menu Themes > Customize Theme after installing this theme. ¶ post ¶ YUI-fy WP Theme (12) ‡ CSS Grids (3), YUI Grids CSS (12) Length:  words. The advantage of Tab Views is that they allow you add more content to your web page whilst occupying less space. If well done they won’t slow down website-browsing. If you’re using the Ndomche Summary Theme – II Columns for WordPress or Blogger, then the best place to insert this tabbed menu is the header — like on this blog. Don’t bother to contact me for more info. 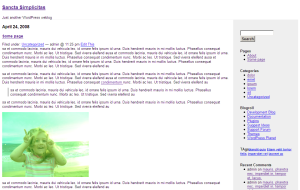 ¶ post ¶ YUI-fy WP Theme (12) ‡ tab menu, wordpress (5), yui examples (4), YUI Tabview Length:  words. Original Article at YUI Official Blog By Christian Heilmann, July 2nd, 2008. As I had to upgrade my personal blog to the newest WordPress version (and my old theme had been hacked to death), I chose to start from scratch with a WordPress theme. As I am a lazy person and I think blogging is first and foremost about content and availability, I wanted to re-use as much as possible the good stuff other people have done and then tweak it a bit to fit my needs. Voilå! YUI autogrid minimal, a WordPress theme based heavily on YUI’s Grids CSS and Base CSS with a few changes to fit the HTML that WordPress creates for you. To work around the issue of YUI Grids being optimized for a certain resolution, I used the autogrids trick blogged here previously. You can see a few messier, older versions of this theme at work on my personal blog and on Scripting Enabled, the event I am organising about accessibility hacking later this year. ¶ post ¶ YUI-fy WP Theme (12) ‡ wordpress themes (5), YUI Grids CSS (12), yui hacks (9) Length:  words. Sancta Simplicitas is a WordPress theme that uses YUI CSS utilities: reset, base, fonts, grids. It's very minimalistic in a sense that it's pretty much all white and simple. Hence the name. The theme is probably not usable by itself, but it's a base on top of which you can create your own themes. When creating a new WordPress theme, people usually take the default Kubrick theme but I personally find Kubrick too much. So Sancta Simplicitas has a very minimal stylesheet and is based on the WordPress classic theme. Changing the id doc3 to doc, doc2, doc4 or doc5 will give you different widths of the content. The default doc3 is full width. Then changing the class name yui-t5 will give you different position and width of the sidebar. yui-t1, yui-t2 and yui-t3 put the sidebar on the left hand side, yui-t4, yui-t5 and yui-t6 place it to the right. You can go even crazier from here, nesting grids to get a two-column sidebar and so on, it's really easy with YUI grids and the docs are here. ¶ post ¶ YUI-fy WP Theme (12) ‡ grid builder, technology, wordpress (5), YUI Grids CSS (12) Length:  words. Create a text file and save it at include.html. Include some basic html in this page. Now, let’s set up our first AJAX web page using the YUI library. Our page will simply include the content from include.html when a button is pressed. Let’s begin…. Step 2: Adding script calls to include the YUI library components we will be using. While in production you should put these calls at the end of your body, for this exercise, go ahead and put these in your header (after the meta character type and the title). These scripts include minimized versions of the YUI library. Minimized means that the code base was minimized, with extra characters, comments and spacing removed. This makes the file smaller so the bandwidth is less, but it makes it human un-readable. The full version can be downloaded from The YUI distribution library. Step 3: Create a <div> with an id in the body of your page and a link that will call the AJAX function. The div will be filled with the response from our AJAX call. Include an onclick event handler in the link. There will be another tutorial soon on using the YUI event utility to dynamically include event handers (separating presentation from the content). Make sure that the link’s href leads to a real page. Web standards and accessibility guidelines state that all links should really be links! The YAHOO.util.Connect.asyncRequest method starts an XMLHttpRequest. It returns a transaction object that has properties that you can use, including status, responseText, responseXML and tId. The first argument is the HTTP method. We will cover POST and GET. The YUI connection manager also supports other HTTP methods, but POST and GET are the most common. Think of the XMLHttpRequest as a form submission: choose the HTTP method the same way you would choose a form submission method. The second argument is the URL to which you are submitting the XMLHttpRequest. Think of it as a form action. It is the response page we are requesting. callback, the third argument, is a series of functions that we will define to handle the server response. The fourth argument is only used if the first method is 'POST'. Since we are using 'GET', we can set it to null or omit it. If we were using POST, the fourth argument would accomodate our POST message. Step 6: Define the second parameter: the URL. The second parameter needs to be set to the URL of the file we want to interact with asynchronously. In this case we are simply going to include our static page — include.html — created in the preperation step before step 1. Step 7: Define the third argument: the callback. We’ll add alerts so you can test at this point to see if it works. We’ll replace the success function after we test to see if everything is working thus far. success is the handler code that executes when the XMLHttpRequest is successful. failure is the handler code that executes if the XMLHttpRequest is unsuccessful. Step 8: Save everything and upload both include.html and myfirstajax.html into the same directory on your server. Open http://www.yourserver.com/yourfolder/myfirstajax.html in a browser. If you have an error in your code or didn’t load include.html and myfirstajax.htmlinto the same directory, you’ll get the ""AJAX doesn’t work" alert. If you copy the code in the box above, and uploaded both files correctly into the same directory on your server, you will get the "AJAX Works" alert. If all is good, continue. </div>. We are going to target this div, and insert the content from include.html into the div with innerHTML. The left hand side of the above statement uses the DOM to target the content of mydiv. The function takes the responseText value of the transaction and replaces mydiv’s innerHTML with the content retrieved by the XMLHttpRequest. Save, upload and test again! Step 10: The power of AJAX is being able to make a XMLHttpRequest and altering the content of the page once the page is already loaded. Let’s change our code so that instead of loading include.html while we load the page, we load it dynamically when we click on our link. We included the onclick event handler in the link in step 3. In a future tutorial we will use the YUI event library to dynamically attach an event handler to our link, thereby seperating content from presentation. ¶ post ¶ Lessons (8) ‡ ajax, ajaxify, YUI (5), yui examples (4), YUI Library (4) Length:  words., and modified on: August 5th, 2017.